Bachelorette party Veil hot pink and white, middle length, lush and curly. Bride veil, accessory, bachelorette veil, hens party veil by Julsera Boutique at Nicky's Blog. Hurry! Limited time offer. Offer valid only while supplies last. Hot pink and white middle length, lush and curly veil is perfect for bachelorette party or wedding. It could be great for the bride and bridesmaids. 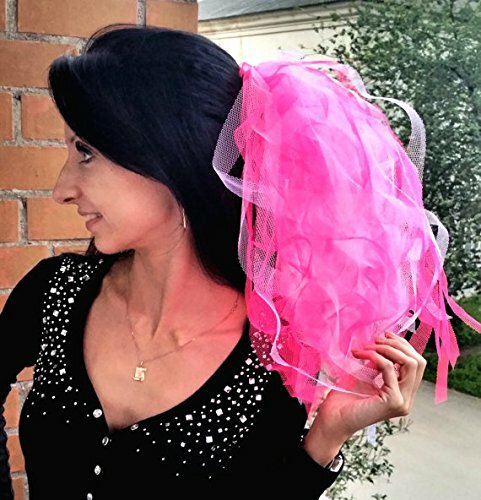 Hot pink and white middle length, lush and curly veil is perfect for bachelorette party or wedding. It could be great for the bride and bridesmaids. Veil is also great for flower girls, or little girls who just want to dress up like a bride for fun! Veil length is about - 45cm or 17,7 inch. Please, VISIT MY SHOP to see all my bachelorette party veils. I have HUGE ASSORTMENT - different models and colors! You will definetely find something for yourself! I can make custom veil for you! I am happy to hear all your wishes. Just convo me. I will complete your order in 1-3 working days. ♥♥♥!!!!!!!!!!!! ♥♥♥ IMPORTANT INFORMATION! ♥♥♥!!!!!!!!!!!! ♥♥♥ I ship via Latvian Post, using international registered mail, which includes TRACKING+ SIGNATURE upon delivery! As soon as I receive the payment, your package will be shipped. I do my best to ship as soon as possible. Shipping time is up to 1,5 - 4 weeks ( usually shipping lasts 1,5 - 2 weeks, but it can still be to up for 4 weeks.) HOPE YOU UNDERSTAND THAT I AM NOT RESPONSIBLE FOR THE POST WORK. I ship as quickly as possible and always can provide shipping documents. So I AM NOT RESPONSIBLE for DELAYED or LOST IN THE MAIL GOODS during shipping. THANK YOU FOR THE UNDERSTANDING! Thank you for looking! For any questions feel free to contact me. If you have any questions about this product by Julsera Boutique, contact us by completing and submitting the form below. If you are looking for a specif part number, please include it with your message.